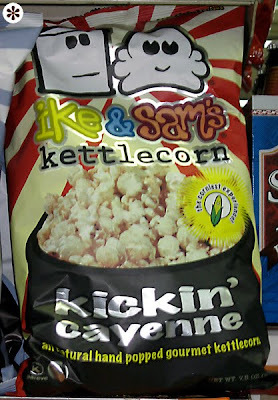 I don’t like kettlecorn, but I bought a few bags of this to replace those scratchy throw pillows my wife bought for our couch. This was once a Waffler, and I do still kind of like the little guys, but holy what the ugly else is going on here? If I were to open this bag and vaporized cayenne pepper spices were to fly into my eyes, and I was temporarily blinded, it would be a welcome relief. What?!? How can you not like kettlecorn? Jeez Josh, I thought I knew you. 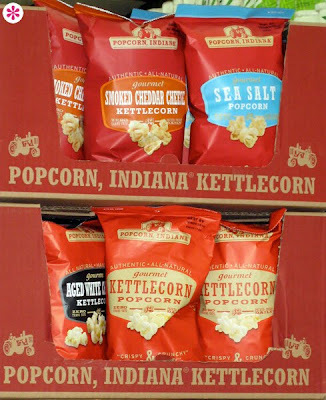 That 2nd bag is what happens when aging hippies and burning man types go from making kettlecorn at local markets and events to mass market packaging. Their personal charm, if you find that sort of thing charming, doesn't translate well on the shelves. I prefer my popcorn movie-style. Sorry. They made a really nice choice for the material the Popcorn Indiana bag is made from, too. The semi-matte finish really stands out among the shiny competitors in the snack aisle. It gives the bag a crinklier feel, somewhat reminiscent of a high-tech paper bag, backing up the homespun concept for the product.